Left to right: David Kelly, Jennie Greenberry, Jordan Barbour. Photo courtesy Jenny Graham and the Oregon Shakespeare Festival. Though OSF has a positive track record with classic musicals, the decision to include Disney’s Beauty And The Beast as part of their 2017 season was nonetheless worrying. Would the theatre festival be able to find new meaning in a Disney musical? Fortunately, director Eric Tucker and a talented cast and technical team knocks Beauty and the Beast out of the park, moving from the bright colors of the original animated movie to a darker, more elegant visual style that makes special use of the live theatre format to tell its story. The gradually defrosting relationship between Belle (Jennie Greenberry), a bold, intellectual girl who yearns for something more than her provincial French village, and the Beast (Jordan Barbour), a cursed prince who must find love to free himself from his monstrous form, sits at the core of the show. Greenberry’s Belle is reasonably faithful to the original movie: Though she’s technically the Beast’s captive, she maintains social control over their relationship for much of the musical. Barbour’s interpretation of the Beast draws from his origin story as a prince, employing a mix of arrogance and social ineptitude. He may have a lot to learn before he can be worthy of Belle, but his slow climb towards understanding is one of the most heartwarming parts of the play. The supporting cast assembles a larger-than-life group of wildly entertaining characters. James Ryen plays the part of Gaston, a swaggering hunter who serves as the story’s main antagonist. Besides getting the best physical comedy in the play, Ryen is able to generate a surprisingly intense feeling of danger: He comes off as stupid for the most part, but his ability to manipulate and threaten is top-notch. All of the transformed objects in the Beast’s castle provide hilarious performances: The conflict between the uptight Cogsworth (Daniel T. Parker) and courteous Lumiére (David Kelly) is a delight to watch. What separates the OSF production of Beauty and the Beast from its other stage and movie counterparts is its visual aesthetic. The set (designed by Christopher Acebo) doesn’t use static elements, but instead uses ensemble members carrying props to give the feeling of a location. This allows for greater use of motion; when Belle is given a tour of the castle, for example, the cast moves doors and windows in a circle to give the illusion of movement. Ana Kuzmanic’s costumes for the transformed objects convey the nature of the character without sacrificing elegance; Lumiére’s outfit, which employs gloves covered with LED lights, deserves special attention. 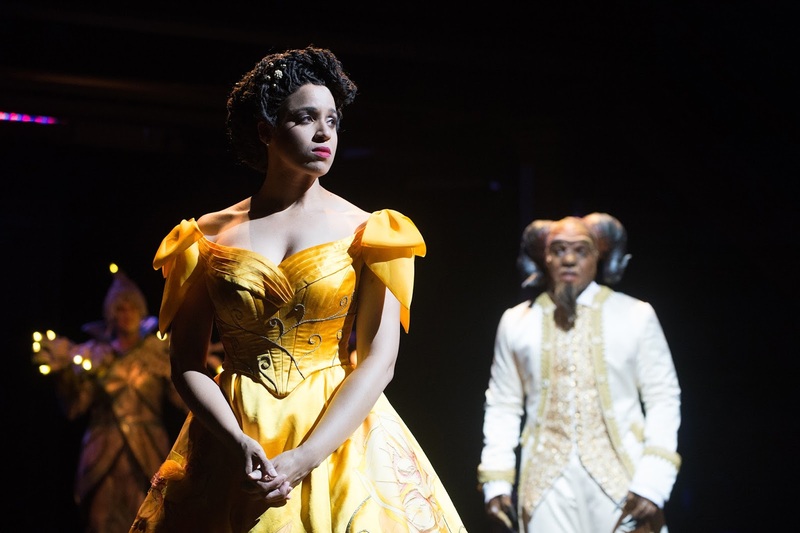 OSF’s 2017 rendition of Beauty and the Beast repackages one of the classic stories from the Disney canon with mature, daring visuals that change the way we understand it. The production ranks with fascinating OSF productions like Guys and Dolls and My Fair Lady as part of OSF’s commitment to find new meaning in some of America’s most classic musicals. Beauty and the Beast runs until October 15th.